Poster Holder. 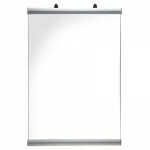 Holds heavy-weight posters in a range of sizes. Top profile comes with sliding hangers. Sold in pairs.